Sexuality is a serious challenge to evolutionary hypotheses and requires broad approach to the study of life. I think that natural selection alone is not sophisticated enough as a tool to explain the duality of Ying and Yang in nature. Better scientific explanations are needed. 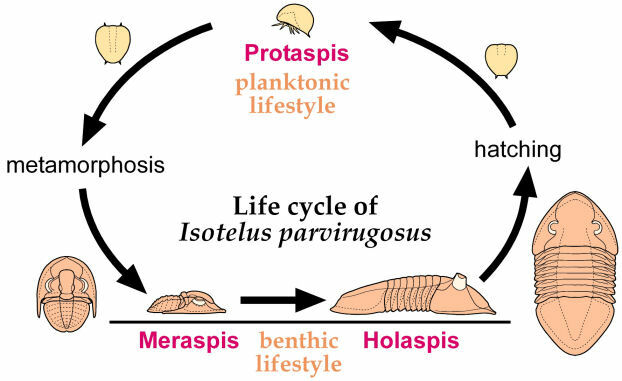 But the drawing of the life cycle of Isotelus parvirugosus really hits the nail of complexity to the reconstruction of the origins and develompent of life. Why such enormously complex and difficult to figure out system? I do not try to explain the life cycle here - it is complex - and I only refer here to Sam's page on Trilobite ontogeny as an accurate source of information on the subject.